A packed public comments hearing on the recent Nestle permit. 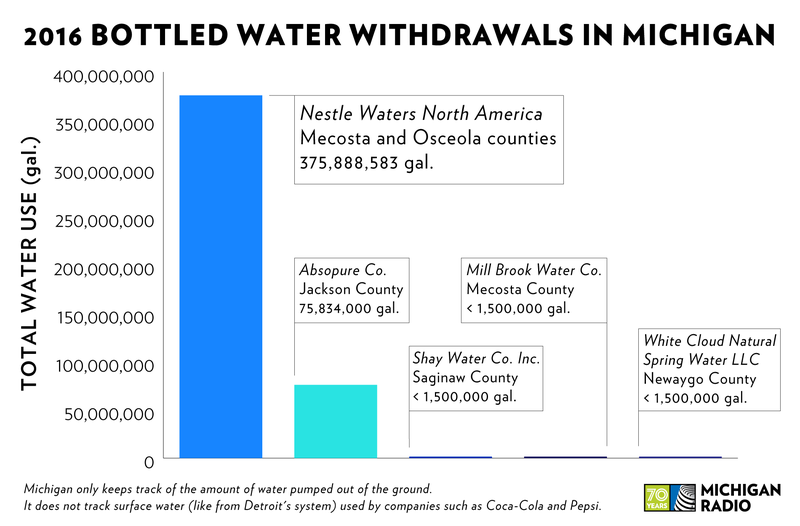 The decision provoked some widespread outrage, for several reasons: Water withdrawals for export outside the Great Lakes basin are instantly controversial, and Nestle only pays $200 per year for over 200 million gallons of water it can sell at incredible profit. But as Michigan Radio first reported, the kicker in this particular case is that MDEQ received more than 80,000 public comments opposing the new Nestle permit, and only 75 supporting it — but signed off on the permit anyway. This begs a larger question: If MDEQ approved this permit despite such an overwhelming show of opposition, does public comment have any impact on its decision-making at all? MDEQ’s standard response is that the agency must follow the law, not public opinion. So if a permit application meets all the technical requirements, the agency must approve it, no matter how unpopular the decision may be. This makes sense. MDEQ is a regulatory agency, so it doesn’t make the rules, it just enforces them. And since well before the latest Nestle decision, it’s taken a consistent public stance: We read and review all public comments, but only those that address legal or scientific aspects of a proposal are seriously considered. In other words, to really change our minds, you need to address some sort of technical deficiency in a particular permit. But environmental advocates say that stance conceals a couple of problems. They argue that since MDEQ largely considers proposals on an individual basis, they tend to overlook larger cumulative impacts on the environment — and even when those are considered, the agency finds a way to narrow the requirements so much that almost anything goes. Some suggest that boundary-stretching goes so far, the MDEQ actually doesn’t comply with the laws it claims to strictly uphold. For example, in Nestle’s case “the law for the permit requires real hydrological data of ‘existing conditions’ and ‘predicted effects.’ Yet [MDEQ] issued a permit based on a model, not real data of existing conditions or to estimate real or predicted effects,” says Jim Olson, a Traverse City environmental attorney who works with the group For Love of Water (FLOW). Olson says in this case, copious amounts of such data actually do exist: from the court case Michigan Citizens for Water Conservation vs. Nestle, which examined a decision to allow Nestle to pump up to 400 gallons per minute for its Mecosta County bottling facility. That data indicated that “Nestle caused substantial harm at rates above 200 gpm to proposed 400 gpm, and the courts found it unlawful” (the Michigan Supreme Court eventually overturned the lower court decision in that case on a legal technicality). “They said they heard all these [80,000+] comments, but it really didn’t matter very much because they are hamstrung by following the four square corners of scientific and legal obligations,” said Kirkwood. But MDEQ director of communications Melanie Brown disagrees with that take, on the Nestle permitting decision or any other. “One of the things that Michigan DEQ has really strived to do is to make sure we are providing everyone with the opportunity to participate in the issue,” Brown said. Brown said the agency’s goal with public comment is not just to give an opportunity for public feedback, but also to help citizens understand some of the more technical aspects of the MDEQ’s decision-making. “We want to make sure that statutory elements are adhered to, but we also want to make sure that we provide the community ample opportunity to be able to voice their concerns, as well as to have a discussion with us about each of these permits,” she said. Kirkwood agrees that, generally speaking, MDEQ shouldn’t be making decisions about complex legal and scientific issues based on public opinion. But she says the level of public engagement generated by the Nestle permit should have spurred the agency to at least take a closer, more thorough look at every aspect of the permit. While the Nestle case is clearly a big deal, it’s also worth keeping this withdrawal in perspective. According to its annual report to the state legislature, MDEQ authorized a total of 394 “large quantity water withdrawals” from July 2016-July 2017 (during that same time, it denied permit requests for 11 withdrawals). And despite the massive quantities of groundwater Nestle is being allowed to withdraw and bottle, it pales in comparison to the amount that’s used by the state’s agriculture industry, which accounts for the bulk of large groundwater withdrawals in the state (electric power generation accounts for the most water withdrawals overall, but that sector mostly draws from surface waters like the Great Lakes). Nonetheless, the issue clearly “hit a raw nerve,” as Kirkwood notes. As did the fact that overwhelming public sentiment on such a sensitive issue seemed to have no substantial impact on the decision-making process. But, at least for now, that’s the lay of the land when it comes to environmental rule-making in Michigan. Political roundup: Should we treat water as a public commodity like Alaskans treat oil? The Michigan Department of Environmental Quality approved a permit for Nestlé to increase pumping out water from 250 gallons a minute to 400 gallons at a facility in Osceola County. That approval came after overwhelming disapproval from citizens. The DEQ says it must follow the law when making permit decisions, which would seem to get rid of necessity of taking public comment. Vicki Barnett, former Mayor of Farmington Hills and a former Democratic legislator, and Ken Sikkema, Senior Policy Fellow with Public Sector Consultants and the former Republican majority leader in state senate, joined Stateside to discuss how effective and desirable the DEQ and public comments are, how the legislature should treat water resources, and how the decision will affect the state’s farmers. Stateside’s conversation with Candice Miller, Macomb County Public Works Commissioner and former Republican congresswoman. Now that the state has approved a permit for Nestle to remove more water from its Osceola County well, opposition is growing. Among the critics: Macomb County Public Works Commissioner and former Republican congresswoman Candice Miller. Jack Lessenberry for Thursday, April 5. There’s little doubt that the most appalling part of the Snyder administration has been the laughably misnamed Michigan Department of Environmental Quality. You have to give the MDEQ this: It never misses an opportunity to show that it doesn’t care about the environment, or what the citizens of Michigan think, unless they happen to be executives of large corporations.